The trouble with Jesus was that He refused to play by the rules of conventional, religious wisdom. That wisdom stated that God rewards the good and punishes the sinner. But Jesus unsettled the conventional wisdom. He forgave people who by their obvious misconduct revealed themselves to be truly wicked. And, to add insult to injury, He blasted the good religious folks who by their obvious outward conduct appeared to be godly. With Jesus on the loose nobody knew what would happen next. Sort of like grace. Jesus spoke and acted as if He were actually in charge, as if He had the final authority over life and death. That, of course, is our problem with God. We too have a conventional religious wisdom. And that wisdom tells us that we have a free will that must choose God. God may be the Creator of the universe, the One who is beyond time and space, eternal and almighty, but where we are concerned, God stands with His hat in His hand waiting for us to decide. We like this conventional, free-will view of God because it keeps us in the center of the action, where we can work on our variously defined programs of godliness and success, showing God how serious we. This is precisely what Jesus ran into among the religious of his own time. Claiming to be all about God, they were actually all about themselves, even if their intentions were good. That, in the final analysis, is what free will religion comes down to. It’s not about God, it’s about me. And the insistence on hanging on to even a little bit of freedom where God is concerned, reveals that the will has already made its decision. It has decided for the self, and that leads not to life, but death. Jesus came to the grave of Lazarus to say something and to do something full of grace – free, unmerited grace. He came in His own time and on His own terms. And when He arrived He took control of the funeral. 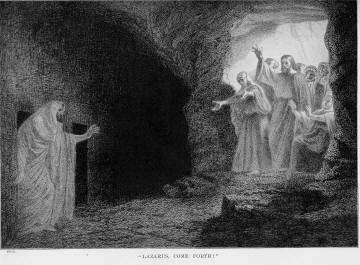 He commanded the grave to be opened and he called Lazarus out of the cold grip of death by a word. Hanging on to the illusion of free will is about as useful as the dead hand of Lazarus clutching his burial shroud. So, that same Word of death-defeating grace and power must be spoken to you. God saves you by His grace. God chooses you. In the absolution and your baptism, this same Jesus who was plunged into death, wades into death’s deep waters to find you – and does some free-will choosing of His own.